I have to say that Lesley Harrison is one of the nicest people you would want to meet. She is very generous and a great teacher. Her artwork is absolutely Excellent! The workshop was three days long and it was in Placerville, CA. The first day we worked on techniques and started to do a kittens eye. The second and third day we worked on this adorable little kitten named "Lola". Lola was done on Velour dry mount paper in a light gray color. We used soft pastels, hard pastels and some pastel pencils. I just loved working with the pastels on the Velour paper, it gives you such a soft look and yet it allows you to get the detail in as well. 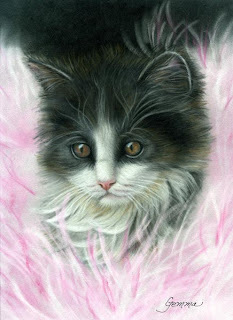 I will definitely be doing more of my animals with Pastels on Velour. I had a great time and really liked Lesley's process to achieve the realism I love to get. In September, 2008 my husband and I took a trip to South Africa. That had to be the best vacation I have ever taken. We went to two Game Reserve Parks and I took over 5,000 pictures of the animals. Wow... what an experience. I recently decided to try to enter some of my photos in a photography contest given by "Photography Forum Magazine". One of the photos I entered was the zebras on the left. I titled the photograph, "Africa From The Back Side". From what I understand, there were 3,500 photographers that entered that contest. I entered 4 of my photos. I just got a letter from the magazine telling me that one of my photos was accepted. I was so excited I was literally jumping up and down. The accepted photos will be published in a coffee table book titled "Best of Photography 2009". They still need to judge the show for the winners and we will hear the results of that judging August, 17, 2009. I don't expect to win anything but, I am just absolutely thrilled that I was accepted in the show along with being published in the book. This Sunday I will be leaving for the Colored Pencil Society of America's 17th Annual Exhibition and Convention. I was invited to donate one of my small pieces of artwork for the Silent Auction. 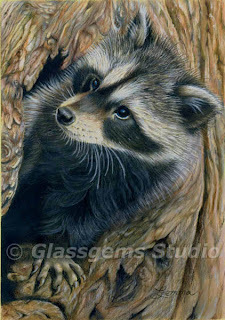 The piece I am donating is this little raccoon, the title of the piece is "Hiding Place". It's 10" x 7" and matted to 11" x 14". It's 100% Colored Pencils done on UArt 800 grit. I mostly use Prismacolor pencils and Derwent Studio pencils. Some times I do use some of the other brands. I found that it really doesn't matter if you mix the oil based and wax based pencils. I haven't had a problem doing this. This was the first piece I did on the UArt sanded surface paper. 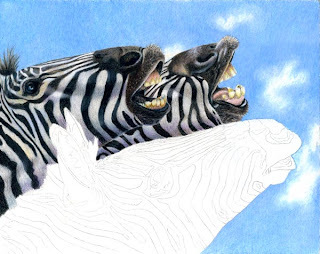 I just love that paper and I am sure I will be doing many more of my Colored Pencil pieces on that surface. If you haven't used it yourself I highly recommend it. The reference photo for this little guy was one that I took while I was in Kalispell, Montana. There were two raccoons, they were so cute so I got lots and lots of pictures of them. I'm sure I will do more art from those reference photos. I found it is always fun to do artwork from your own photos. It's a real sense of accomplishment. Well... I was able to get another one of the zebras in. I thought I would post what I have done so far. Anyway.... back to the zebras. I like how these are coming along. In fact I kind of wish I would have done them larger like I usually do. These are only 8" x 10", that's a lot smaller than I usually work. I really like the Artboard with Arches hot press water color paper on it. I love how the pencils lay down and it seems to take lots of layers. I probably won't be able to get much work done on these in the next couple of weeks. I have lots going on but if I do I will be sure to post the progress. I was finally able to get some work done on this piece. Here's a quick update. I think I really like the Artboard surface. It seems to accept a lot of layers and is quite easy to blend the colored pencils. I'm looking forward to seeing what the piece looks like once it's varnished and in a frame. This is a really fun piece and I am really enjoying creating it. Sorry I haven't posted lately. I have been gone for about a week and I'm now preparing for the Colored Pencil Society of America Convention. 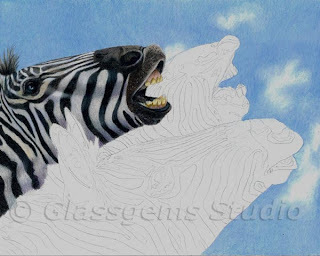 Most likely I won't have an update on the zebras for a while because this month I am just swamped with things going on. Next week I will be going to the Pastel workshop taught by Lesley Harrison. After that I will be going to the CPSA 17th Annual Exhibition. I am a board member so, therefore have lots to do to prepare for the convention. I thought I would take this opportunity to let you all know that I will be giving a workshop at our local CPSA District Chapter. The workshop should be in the month of October but I am not sure of the exact dates yet. All I know at this point is the workshop will be in October in Livermore, California. If any of you are interested in the details please let me know and I will provide you with that information as soon as it scheduled. 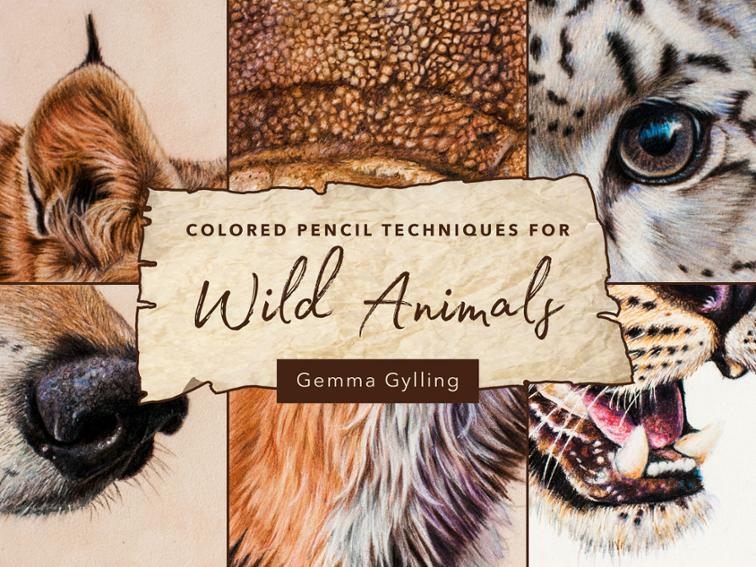 Participants in Gemma's workshop will learn to create realistic animals using colored pencils. By learning to draw an animal's eye, nose, mouth and fur, participants will master the steps needed to create believable looking animals. Students will learn how some common household items can be used to blend, burnish, impress lines and create very believable animal characteristics. Gemma will share her secrets on the best ways to break a reference photo down to small manageable sections rather than viewing the drawing as a whole. There will be a discussion on photography as it pertains to your animal/wildlife artwork and Gemma will share how to create a good composition from your own reference photos. 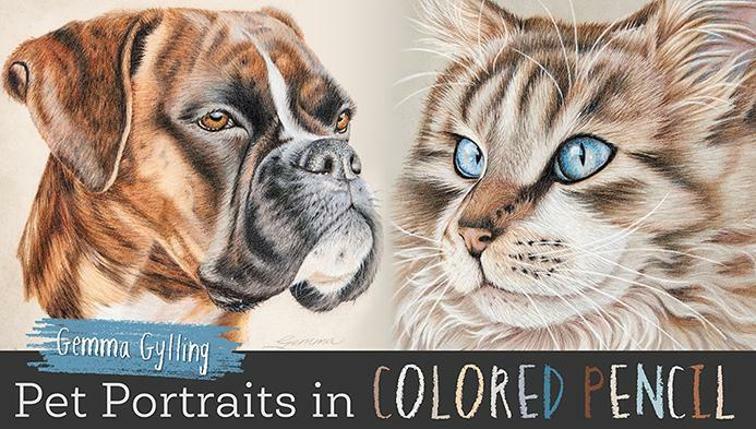 She'll discuss the best ways to create a great drawing utilizing Photoshop to combine photos, including discussions on what to consider and how to avoid mistakes when putting an animal into a surrounding area or scene. On the second day the participants will learn how to draw portrait of a Lion cub. 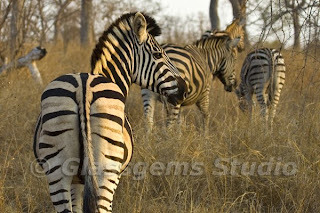 The reference photo you will be working from is from a photo shoot that Gemma took while on an African Photo Safari. You will learn how to create the realistic look of young cub using Colored Pencils on Uart Paper.